Indigo at The O2 is the hidden gem within The O2, the smaller entertainment venue next to the arena under The O2 roof, perfect for live music, comedy, club nights and so much more. Do you work at Indigo at The O2? Depends on what is showing. What did you think of Indigo at The O2? I went to kisstory last Saturday and it was awesomee! Loved the live singers and danced like crazy. The vip area upstairs was cool, we didn't have a table reserved but my friends got a bottle and the waitress help us with it anyways. That was nice night. I would definitely recommend it and we will be surely going again. Saw Calvin Harris perform live here in the summer. Was one of my best nights out to date. The main performance arena is set out nicely with a bar surrounding at the back and easy access to the cloakrooms. On the higher floors there are additional rooms furbished very well with sofas, booths and surprisingly clean carpets even. The club is set in a nice surrounding with many restaurants near by inside the complex. As with the Matter@o2 club transport there will be hard if the Jubilee underground line is down. Went with my disabled son last night to see LEVEL 42 who were absolutely fantastic as normal! What dissapoints me is that i could not get my son in anywhere to get him something to eat and its somewhere else geared to cram as many people in as possible with no thought how hard it is to manage with disabilities. We just wanted to be like every body else and have something to eat and drink before the show.Also there was no supporting band but once Mark King came on stage that was all we cared about. Once over though, in the congestion that followed trying to get out it took us two hours to get a few yards down the road. Surely it cant be like this all the time? Was really disappointed with this venue tonight! The view of the front stage from much of the seated area is poor. So many people moved from the c*** seats they were sold to empty, I presume, unsold seats, to try and find a better view. Security did nothing about people standing on seats! Will not attend th1s venue again - waste of money! 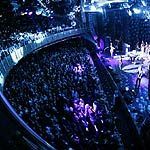 A live music venue that doubles up as a club, Indigo at The O2 is a must for music lovers and those who are simply looking for a great night out. Indigo at The O2 is situated in the O2’s Entertainment Avenue, surrounded by restaurants and bars. With a capacity of just over 2000, Indigo at The O2 boasts large bars, beautifully decorated toilets, and a stunning VIP area. The venue itself looks like a nightclub with dark walls and neon lighting and the stage overlooks a large dancefloor, which is surrounded by a balcony with theatre-style seating. Indigo at The O2 achieves a perfect balance between concert and club and, depending on who is playing, the vibe can vary greatly. The size of the venue guarantees an intimate atmosphere and the dancefloor can get really packed out, although there is plenty of room to relax around the bar area and the air conditioning means that you always feel comfortable. The staff are friendly from the door to the bar, which is big enough to avoid queuing. Indigo at The O2 is a purpose built music venue with great acoustics to make the live music experience really spectacular. The live acts very from urban artists through to rock and blues, as well award shows and club nights. With the dancefloor so close to the stage it feels as if the artist is performing directly to you. There are two large bars and for a music venue the drinks are very reasonably priced and there is a wide range of cocktails, spirits and wines to choose from. For beer drinkers there is seven second pint fast pour technology, which helps you to get served quickly. Indigo at The O2 works well both as a live venue and as a club, with great service and fantastic music. Indigo2 is a great venue. I've been a few times because I work opposite and the people are friendly, drinks' prices are reasonable for the area and the music is fantastic. There's a great atmosphere for live music!